Shark Team One - Cressi Ambassadors! 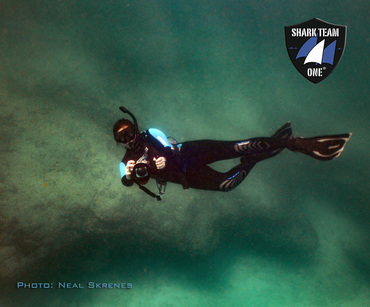 Shark Team One Founder and President, Angela Smith is Proud to Be a Cressi Ambassador! Watch the Cressi Ambassador video to learn about Angela, where it all started, why she loves sharks and what inspires her every day to keep fighting for shark and ocean ecosystem conservation! 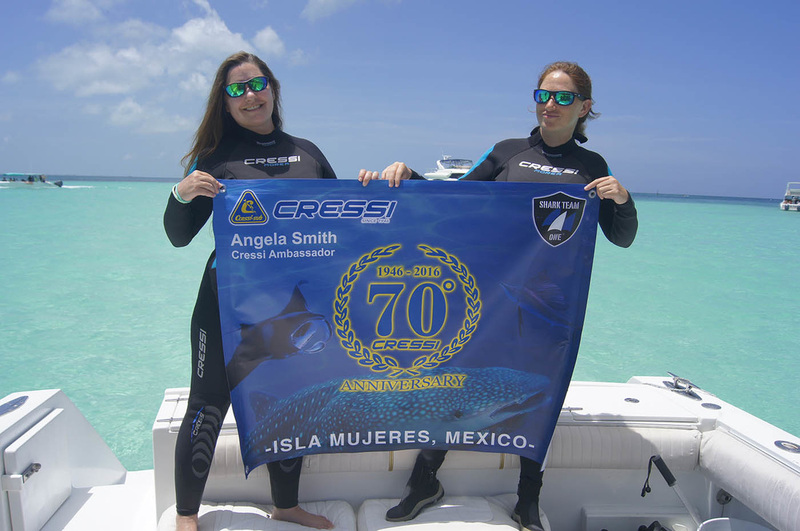 Shark Team One is thrilled to celebrate Cressi's 70th anniversary, proud to have their support and honored to wear their amazing gear! Thank you! Molte grazie Cressi! Apprezziamo il vostro sostegno, tradizione e passione! Watch and share the VIDEO to help us spread the word! Click on the thumbnail photo to the right and head to Cressi's YouTube page. Cressi 70th Anniversary Celebration on our Whale Shark Conservation Expedition! 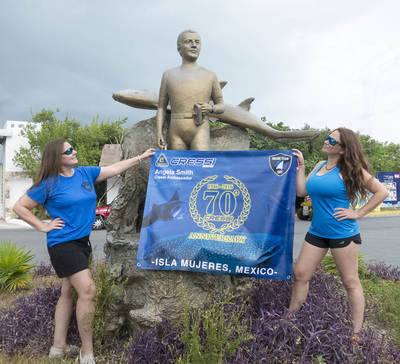 Thank you to our team in Mexico for the amazing support in getting the word out about Cressi's 70th Anniversary! We were so honored to receive this amazing banner which was a surprise gift upon arrival in Isla Mujeres, Mexico! 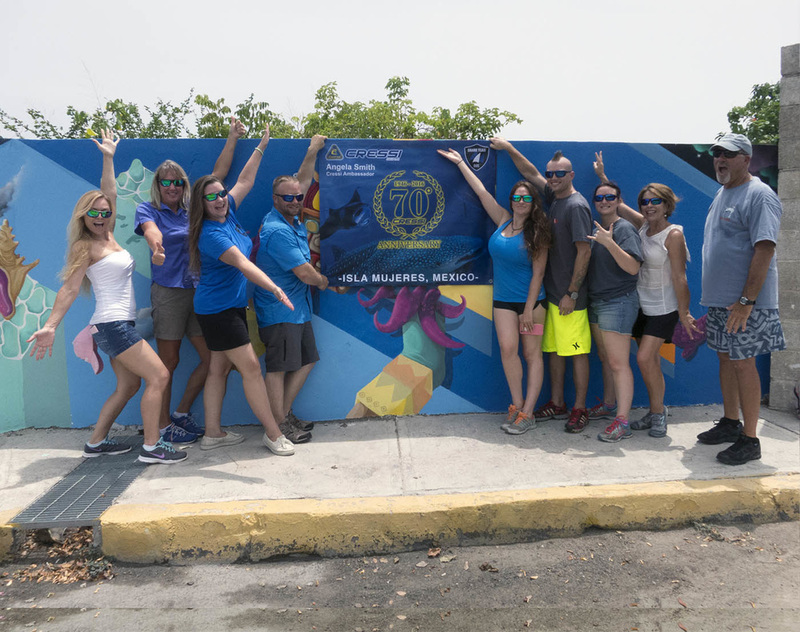 Isla Mujeres is known as a worldwide spot to see whale sharks, manta rays and sailfish during their annual migration routes past the island, so each of these majestic species was depicted on the banner! We used it during the expedition to help celebrate Cressi's 70th Anniversary, to show our support for the conservation of the animals it represents and because we are so proud to recognize the Cressi brand while we travel all over the world! ​We took the banner with us everywhere as you can see in the images below! Click on the photos to enlarge and see the captions to learn about the island. ​Thank you Arturo for this kind gesture and thank you to Cressi for your support! We are honored to represent the Cressi brand worldwide and Happy 70th Anniversary!